Bishop was in checking out the yellow Mustang convertible in our showroom. He seems to be looking forward to summer. Congratulations on being our Dog of the Week. 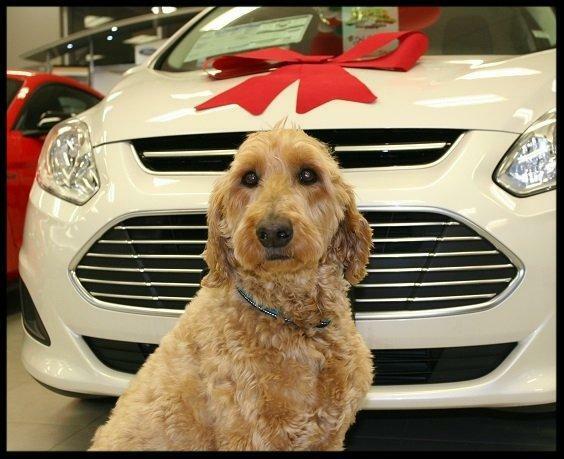 Bo was in checking out our Christmas tree while his owners were picking up their new MKX. Congratulations Bo on being our Dog of The Week! 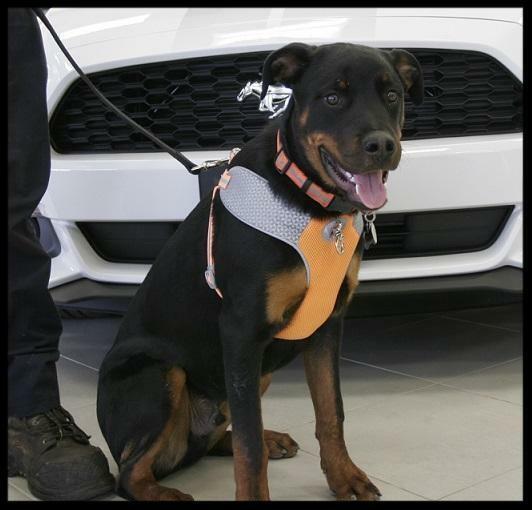 Rico stopped in at the dealership and thought his owner should pick up the Mustang Convertible we have in the showroom. Good choice Rico and congratulations on being our Dog of The Week! Nelson found a nice spot to relax on the floor while he was visiting McAlpine. Congratulations Nelson on being our Dog of The Week. 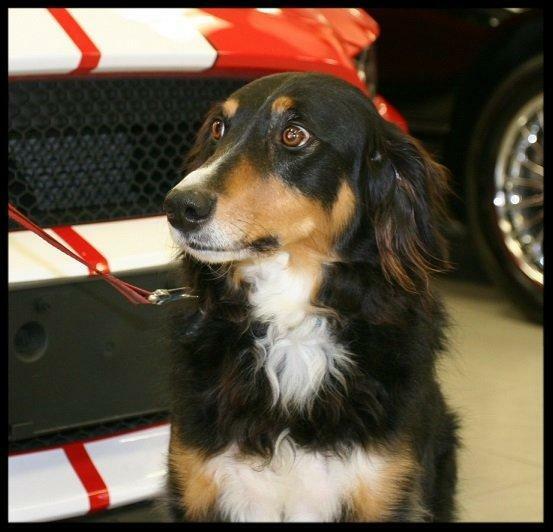 While visiting McAlpine Ford Squeaky gravitates towards the Race Red Mustang GT in the showroom. Great choice squeaky and congratulations on being our Dog of The Week! This is Bishop helping his owners pack the car for a weekend getaway. Congratulations Bishop on being our Dog of The Week! 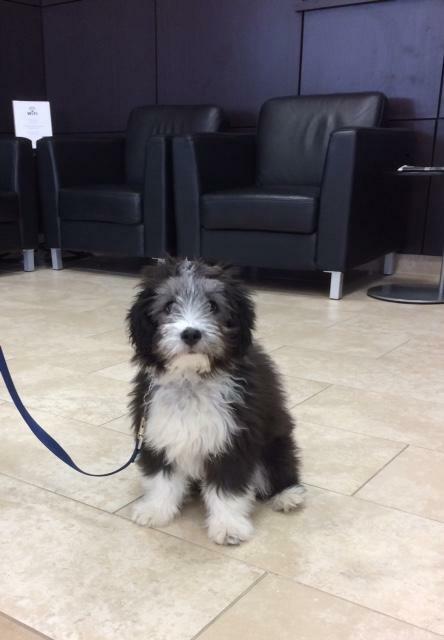 Diesel came into the dealership this week to visit. Diesel was very energetic puppy but we managed to keep him calm long enough to get this great photo. Congratulations Diesel on being our Dog of The Week. Frank the Frenchie came to McAlpine Ford to visit for the first time and was too cute to not receive our dog of the week. Congratulations Frank on being our Dog of The Week. Keith brought Sadie along to get his vehicle looked at today but Sadie gained all the attention with how fluffy she is. Congratulations Sadie on being our Dog of The Week. 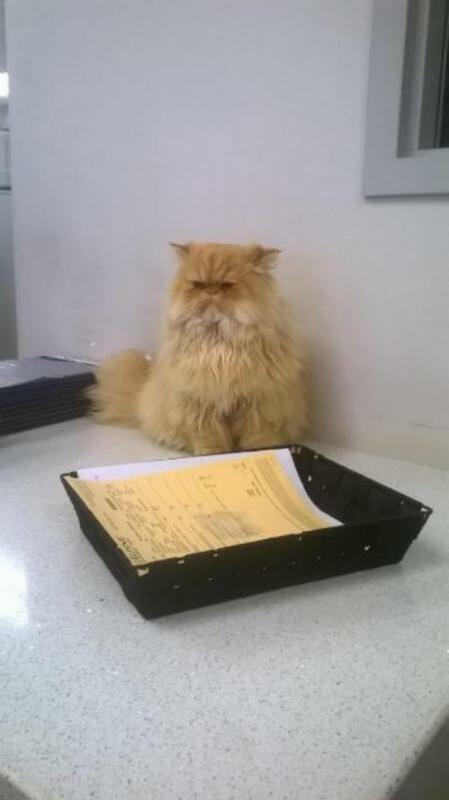 While Bob was visiting the dealership he decided to help us out by looking over a couple of work orders. Congratulations Bob on being our first Cat of The Week. 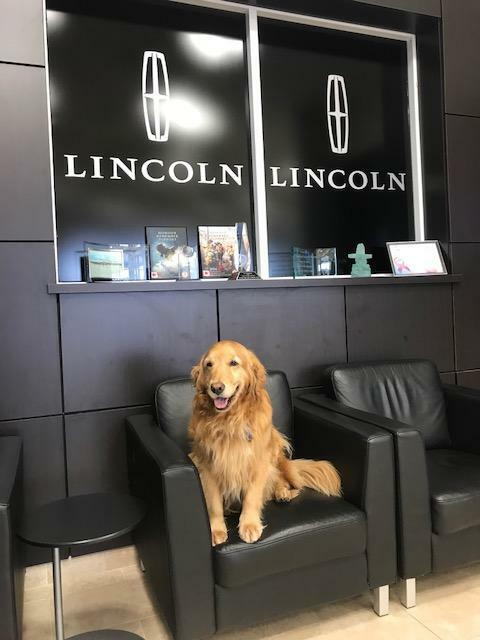 While Justin was in servicing his truck, Abby was taking the time to relax in our Lincoln lounge. Congratulations Abby on being our Dog of the Week. 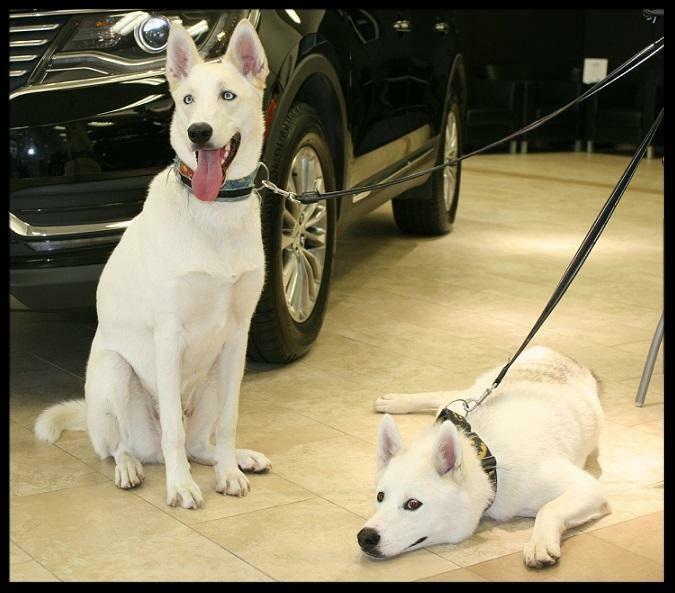 Vivian was in getting an oil change on her Escape recently and brought Nova & Halley along for the ride. Read what Vivian sent below and congrats to Nova & Halley for being our Dogs of The Week. We travel from Toronto to your location because we simply love the customer service we get from you. 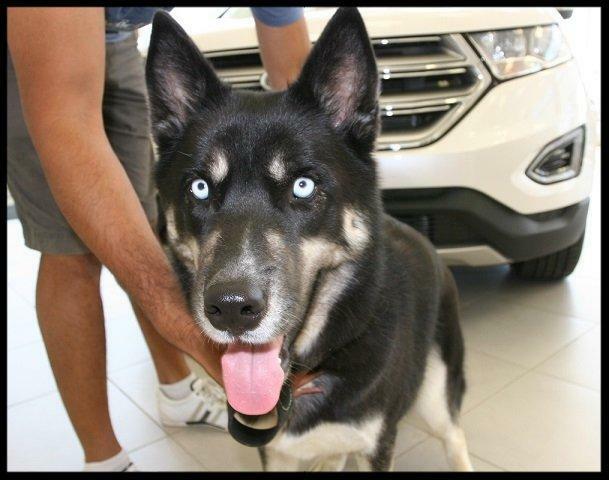 Last December, we traded in a Fusion for an Escape just to accommodate our dogs. We had Halley first, but 3 days after purchasing the Escape, we thought we could add another one, and so we adopted Nova. I often joke that it's their car because the car goes wherever the dogs go. Together, they have a raw dog food company called B.A.R.F. 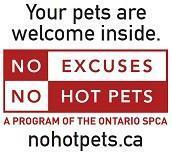 Bento where we portion, cater and deliver a wholesome healthy meal to dogs in Toronto and the GTA. Here is their facebook page. Darlene & Lester were in our showroom looking at F-150's and they seem to be leaning toward an XLT model. 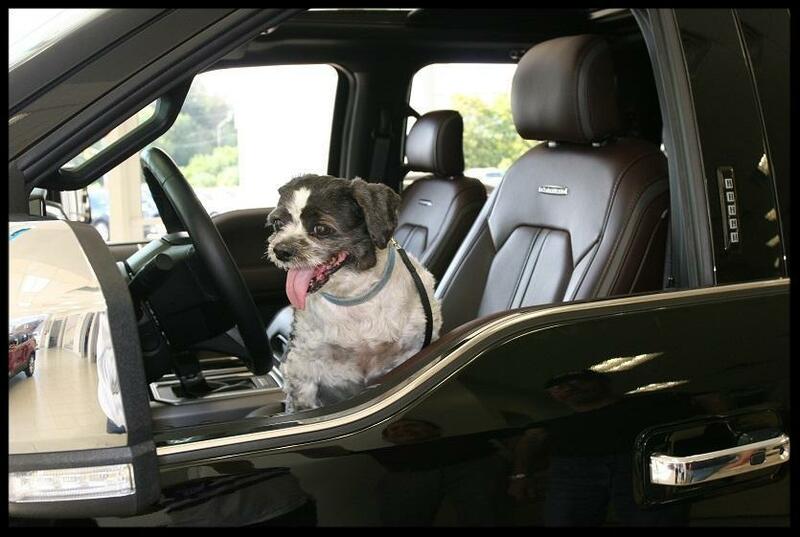 Their lovely dog Oreo seems to think that the top of the line Platinum model is more his style. In the picture above we think Oreo is reminding us that checking your mirrors is very important...or maybe Oreo is just checking himself out in the Platinum. You're looking good Oreo and you're our Dog of The Week. 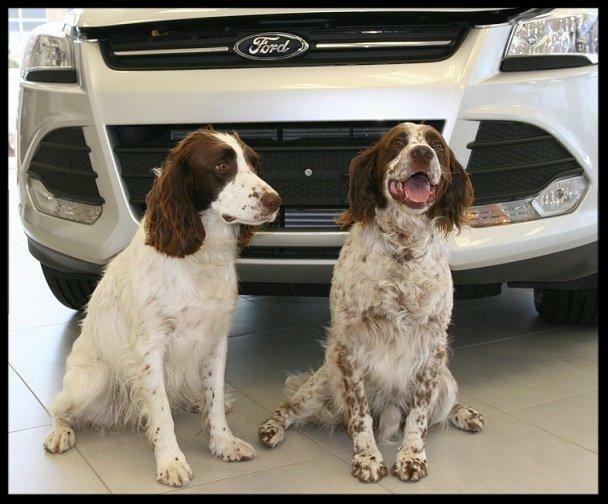 While Sally was purchasing a new Ford Escape, Beezie & Lucy were busy making new friends in our huge 22 car showroom. Sometimes you have to take a break which is what they're doing in the picture above. 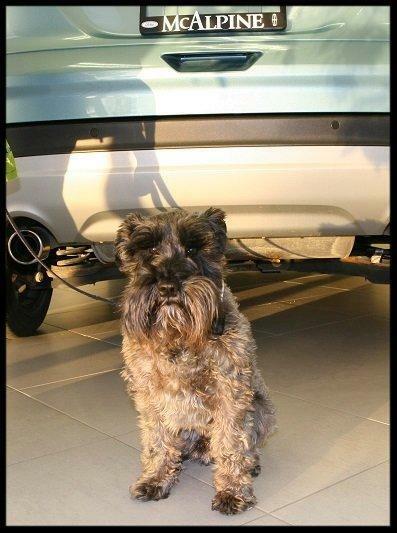 Beezie & Lucy you are McAlpine Ford's Dogs of The Week. Recently Jason Thorne, who is a salesperson here at McAlpine, and his wife Lauren stopped in on Jason's day off. They were accompanied by their beagle Jack. 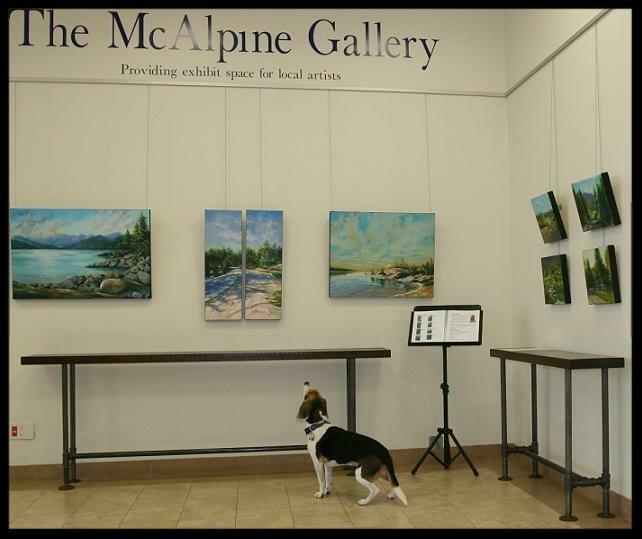 It seems Jack has a creative streak as he was quite interested in the artwork on display in the McAlpine Gallery here at the dealership. We are going to call Jack our Artistic Dog of The Week. Come back soon Jack as the McAlpine Gallery has a new SOYRA artist every two months. Excuse me, can I ask you a question? Sure Henry, ask away. Henry was in with Natalie and her mother Mary looking at Escapes recently. 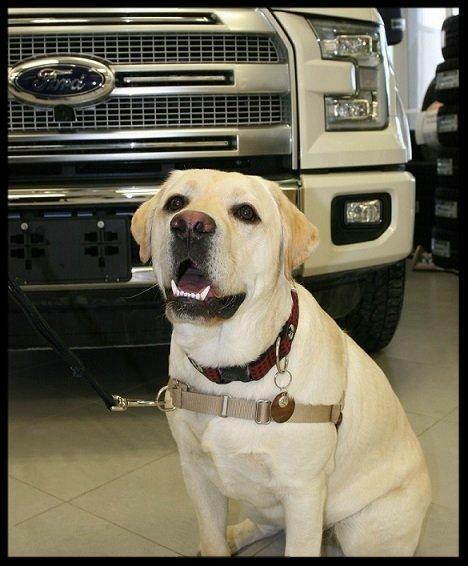 How great is it for a Ford dealership to have their Dog of The Week named Henry. See you soon Henry! You're always welcome. Meet Harley, Sunny and Chris McIntosh. These happy customers were in picking up their new F-150. 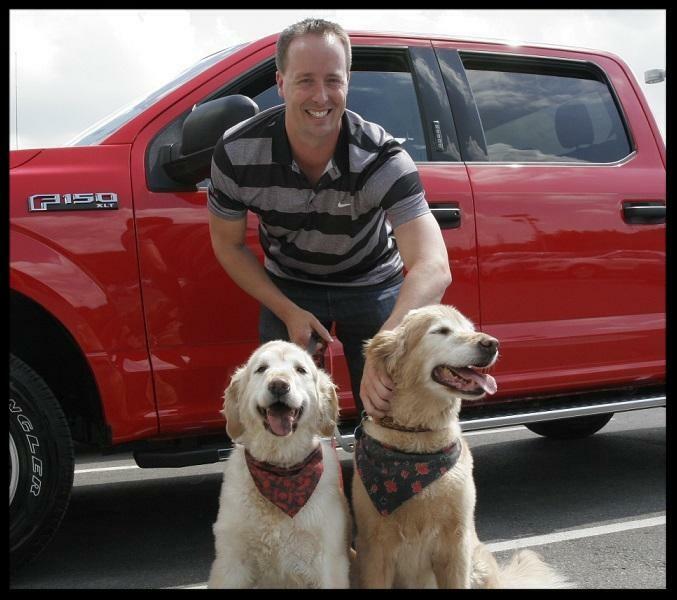 Harley and Sunny are looking forward to their first drive in the new truck as is Chris we're sure. Thanks for your business Chris. Harley and Sunny you are our Dogs of The Week. This is Wesley, an 8 month old Lab that loves meeting new friends. Wesley came in with Greg & Alex who were picking up their new Fusion. 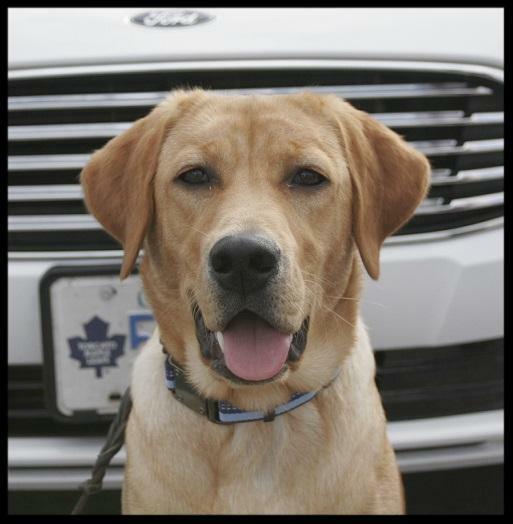 As you can see behind Wesley they are not only Ford fans but Leaf fans too. Way to go Wesley. You are our Dog of The Week. Hi there! My name is Tiffy and I'm 8 years old. I came in with Janet to have an oil change done on our Ford Focus. Not only did I have fun hanging around in the Quick Lane waiting area I've been told I'm going to be the Dog of The Week. Life's great at McAlpine Ford. Jessie was in with Don Finlay recently and had a grand tour of the McAlpine Showroom. Nice to meet you Jessie and you are our Dog of The Week. Hey Mickey pull up a chair and feel at home. Mickey was in with Manon & Adam while their Escape was in service. 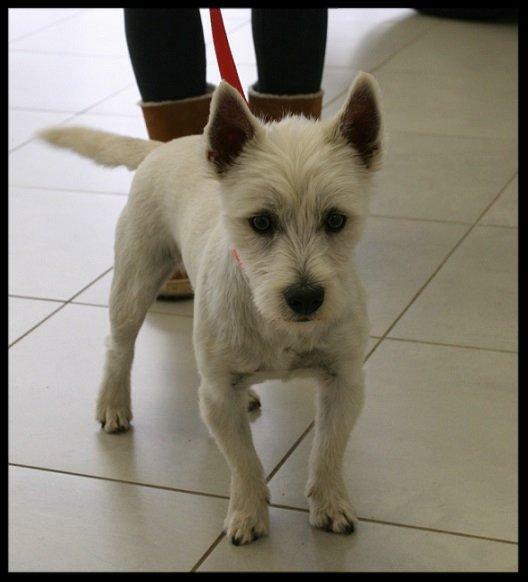 Mickey is our Dog of The Week. Way to go Mickey! This little girl is 5 year old Mini. Mini weighs in at a whopping 3 pounds but for such a little dog she sure commands a lot of attention. Mini was in with Cheryl getting an oil change on their Mustang. 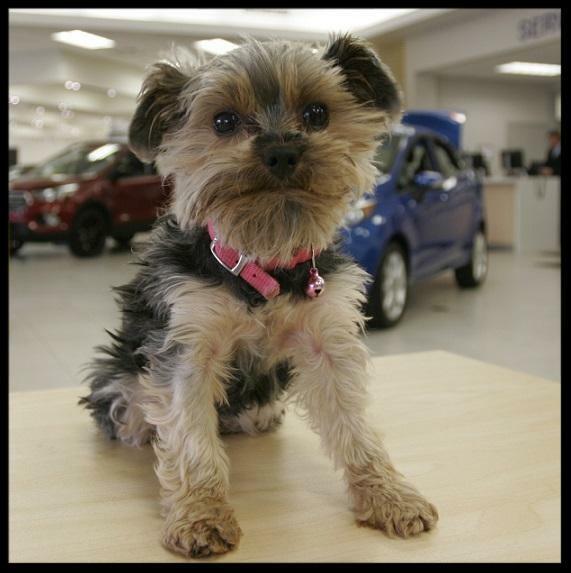 Congrats Mini, you are the McAlpine Ford Lincoln dog of the Week! 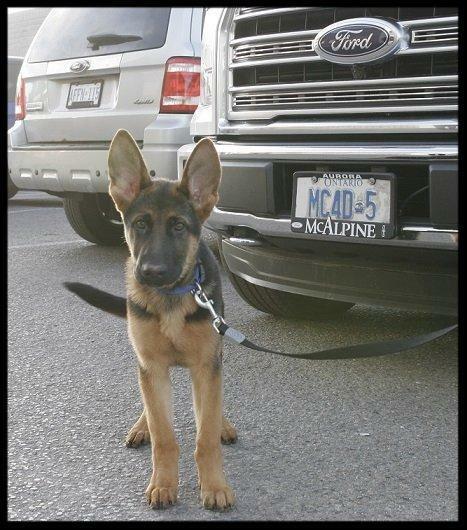 Brad Tredwell, who is one of our technicians brought his 7 month old pup Boulder to work last week. Boulder seemed very interested in seeing where Dad disappears to every day and meeting the people he works with. 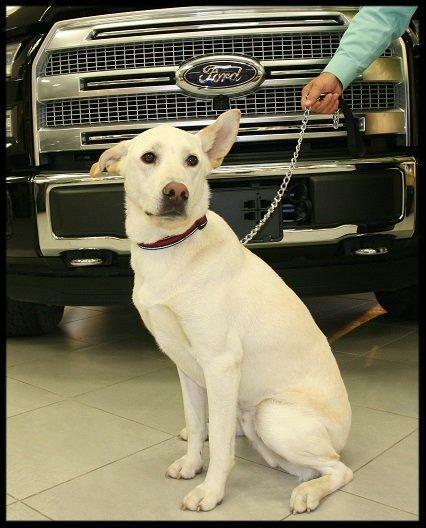 Boulder is McAlpine Ford's Dog of the Week! Well it looks like Kayla has made another friend. Ginger came in with Maryanne & Jim who were buying a new Fusion. Ginger and Kayla found each other and became best pals. 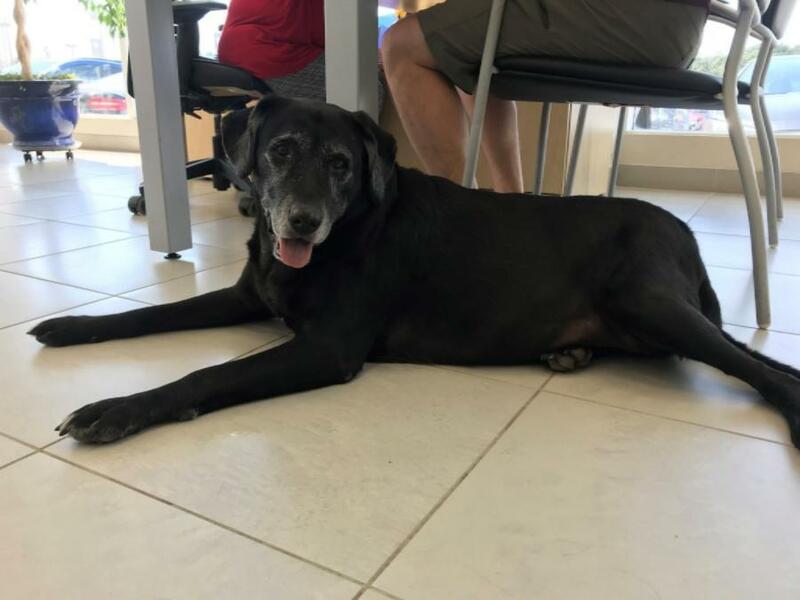 Ginger is 17 years old (yes that's right 17 years old) and is McAlpine Ford's Dog of the Week! Daisy is just 2 months old and quiet as a mouse. 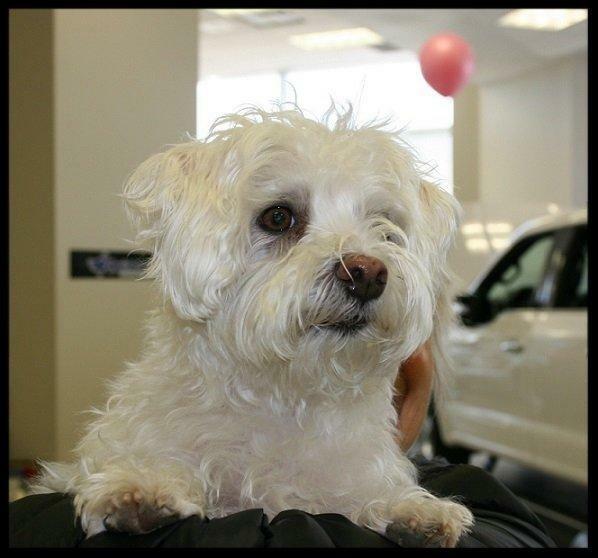 Daisy was in with her mom Angie getting an oil change on their Ford Escape. Daisy is our youngest dog of the week to date. 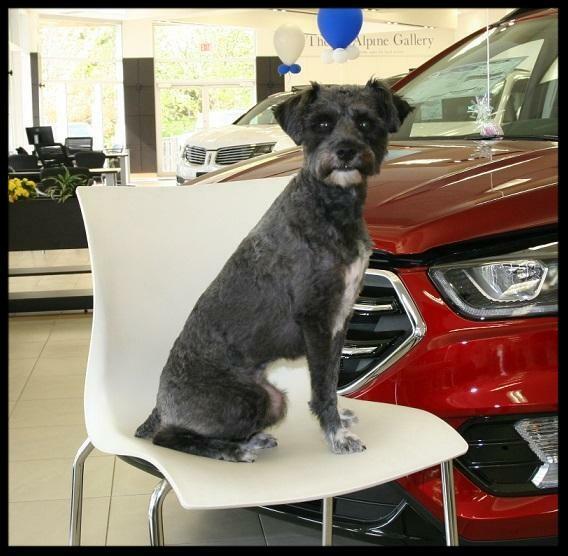 Be sure to bring your dog in when visiting McAlpine Ford Lincoln. 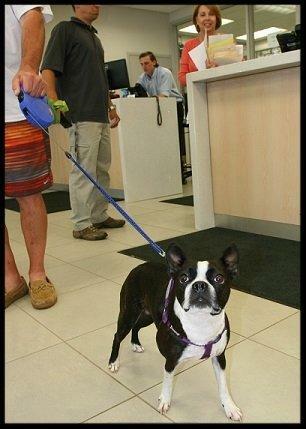 As you can see we are a dog friendly dealership. Angel came in with Laura & Mat when they were picking up their new F-150. 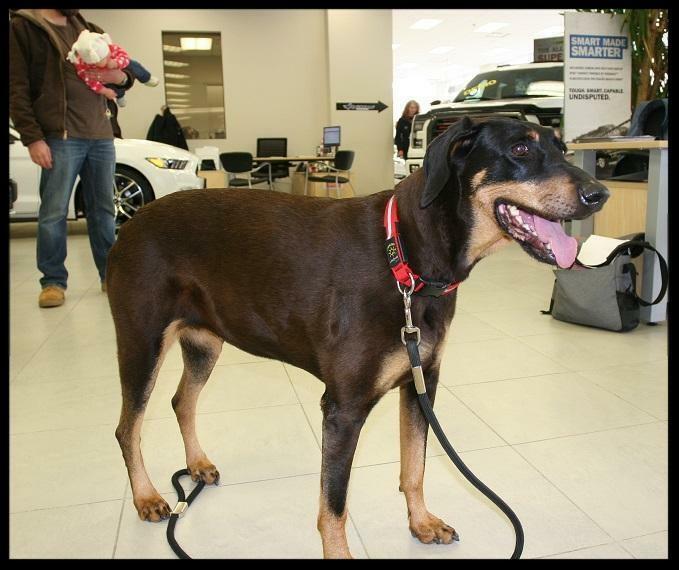 Angel is a nine year old Doberman and we could all see where her name came from. Congrats Angel you are McAlpine's dog of the week. 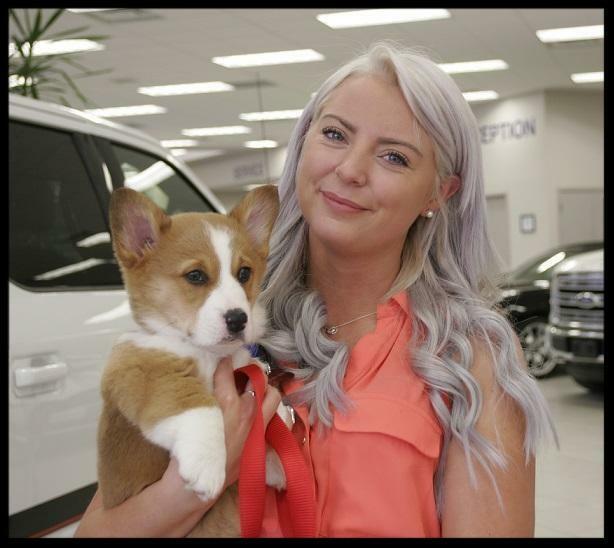 Wrigley, a 9 week old Corgi, came into our showroom with his owner Stephanie while their Escape was getting an oil change. As soon as our sales rep Kayla Pardy saw Wrigley it was love at first sight. So much so that we had to include Kayla in our dog of the week picture. Maggie came in with Paul to buy some parts. 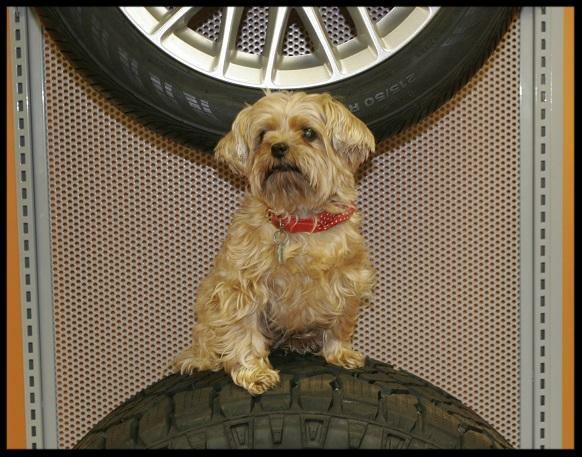 Before she new it Maggie was getting her picture taken as our dog of the week! Congrats Maggie. 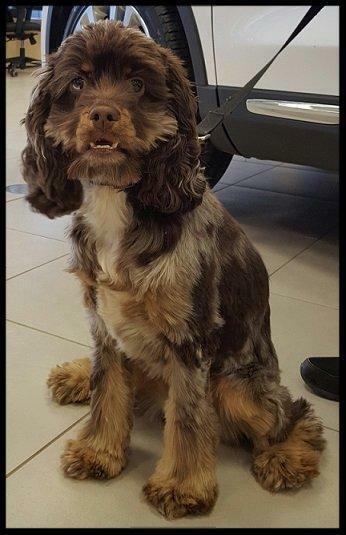 Meet Dexter, a soft and friendly visitor who came in with Marilyn getting an oil change on their Edge in Quick Lane. Dexter is our dog of the week! It was a snow day in Aurora and Ricco was dressed for the occasion. Ricco was in with Steve Lawton getting some work done on their F-150. Keep warm Ricco and enjoy being our dog of the week! 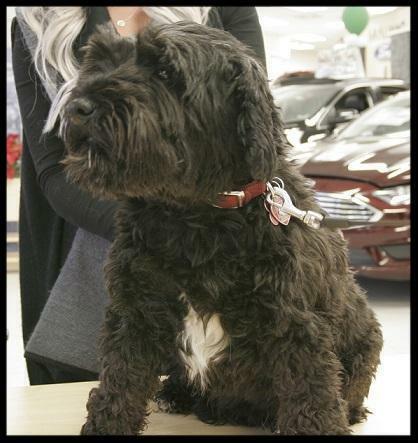 Ozzie was in with Christine getting an oil change on their Ford Edge. Ozzie is our Christmas dog of the week! Is that a popcorn machine I hear? Maxwell was in for a visit this week and was the star of the show. Making new friends and having a great time in the showroom at McAlpine Ford Lincoln. 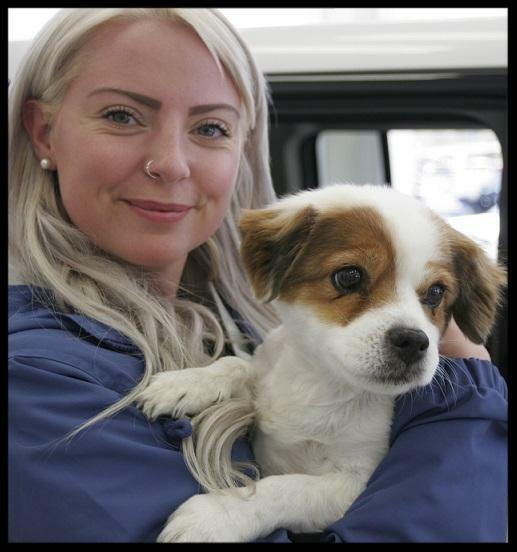 Meet Merlin who was in today with Suzanne picking up a new Escape. Merlin is a very ambitious fellow as he would like to be Dog of The Year. We're all rooting for you Merlin but for now you're the Dog of The Week. 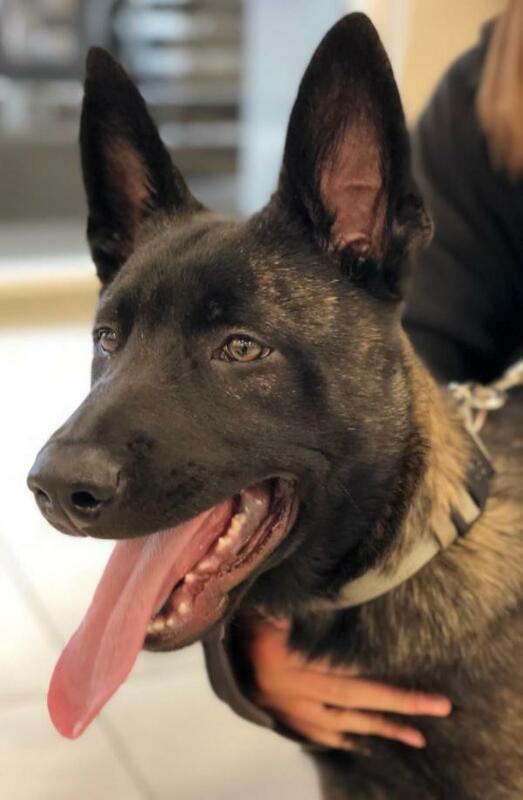 Today we had a visit with 4 month old German Shepherd Jake and his owner Marilyn who were getting an oil change in Quick Lane. We hope Marilyn brings Jake in every 10,000 km so we can watch him grow. See ya soon Jake! 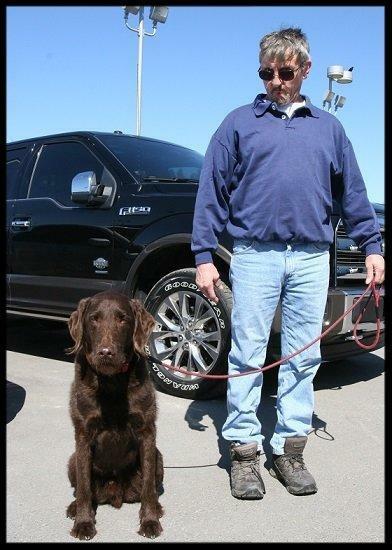 Bill Owen picked up his new Escape today and brought 3 year old Marley with him. Marley called shotgun for the ride home. This fellow's name is Gunnar. We were all amazed at his incredible eyes. You just never know who you'll meet in the McAlpine showroom. 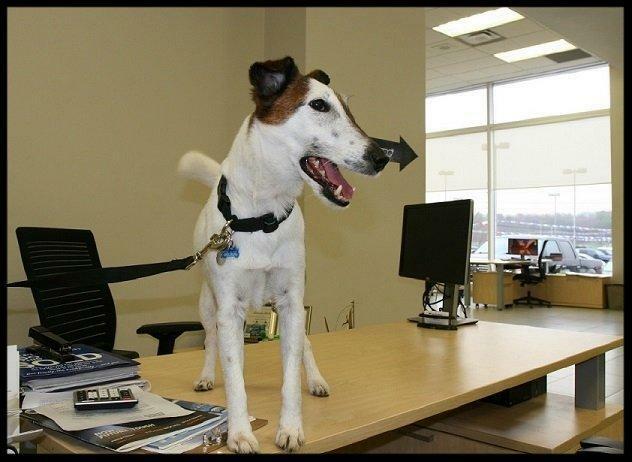 Our General Sales Manager, Randy Winstone, brought his dog Finnegan in to work recently. Finnegan spent his visit guarding Randy's office while he worked. 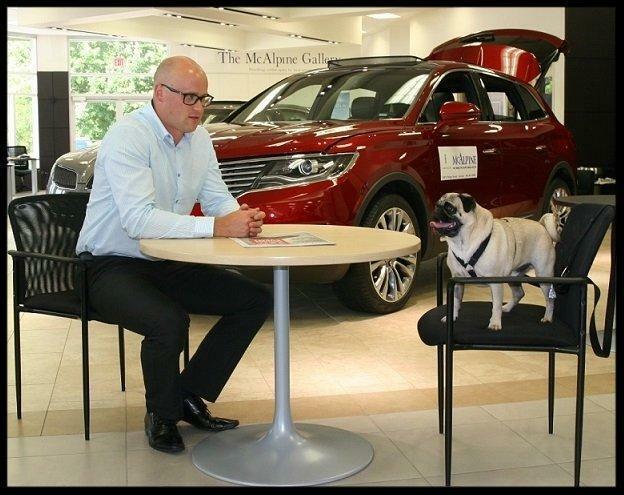 Our Financial Services Manager, Andrew Sawyer is seen here having a heart to heart talk with George in the Lincoln showroom. 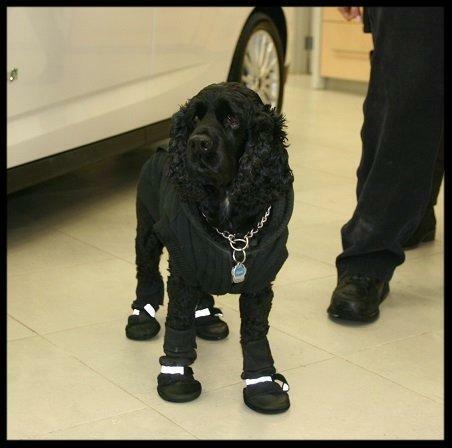 We suspect Andrew was talking up the benefits of interior protection for a dog owners vehicle. 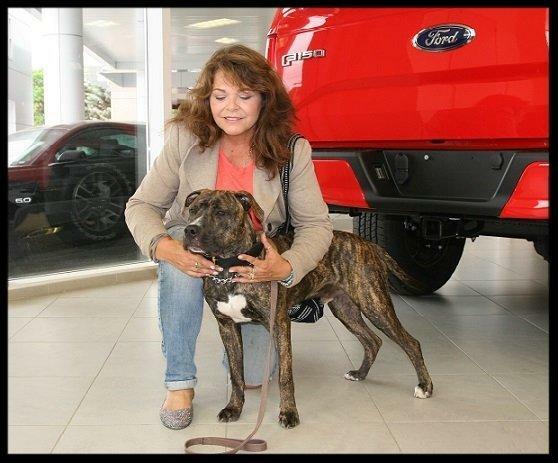 Deena Hampton was in the McAlpine Ford showroom while her vehicle was in for maintenance. Deena's friend is Leo, who has a fascinating coat that looks like a leopard, was actively looking around the showroom making new friends. Catherine Shand and Peter Lambros were in our showroom recently with River and Echo. 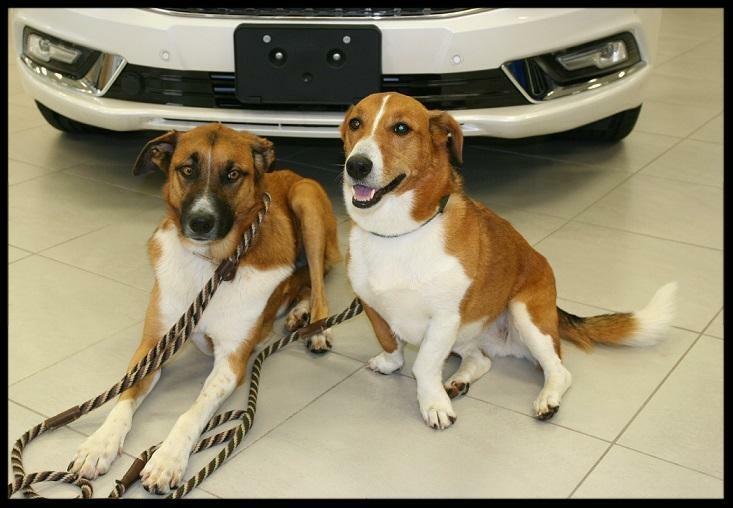 This friendly pair won the hearts of customers and staff here at McAlpine. 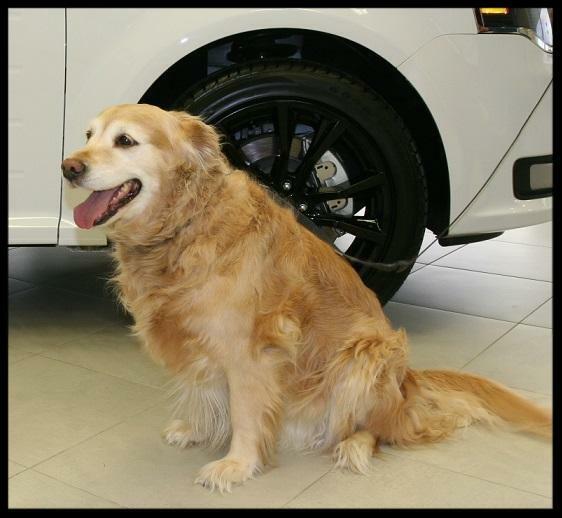 Recently we had a K9 Internet star in our showroom. Hudson has 16,000 followers on Instagram which you can visit here. 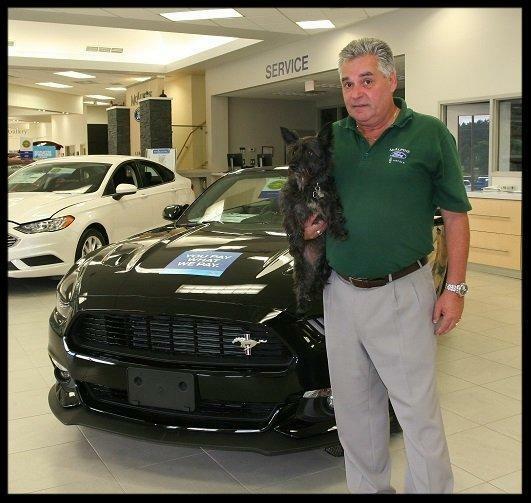 Don Dupuis, our service manager helps Hudson with his Instagram page. Dan Acchione has been servicing his vehicles at McAlpine for over 20 years. Today he brought his pal Peyton along. Such a friendly little guy! 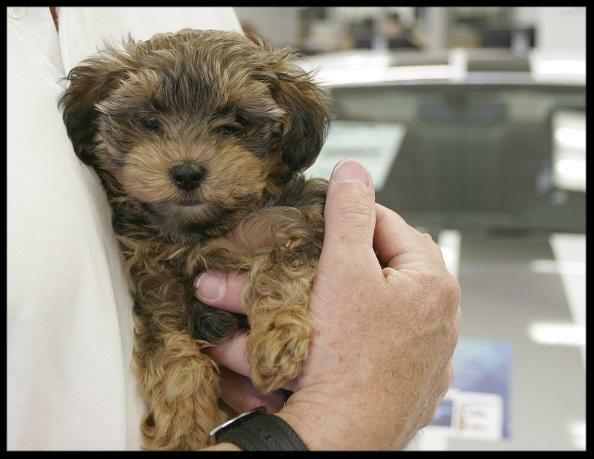 The Muegge's were looking at a new vehicle and brought their pup Benji. 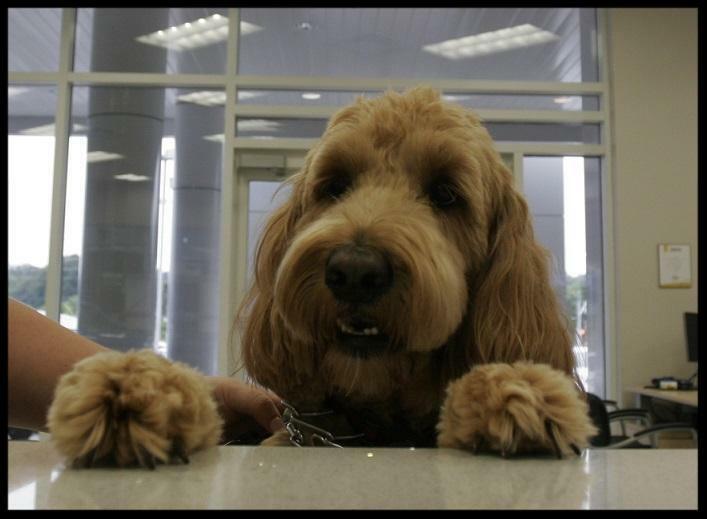 It seems that Benji has no trouble making friends as customers and staff members were drawn to Benji's personality. Max was in visiting us here at McAlpine last week. Dennis has been servicing his vehicles at McAlpine for many years. His companion Remington is well known by all McAlpine staff. It's always a pleasure to see them. 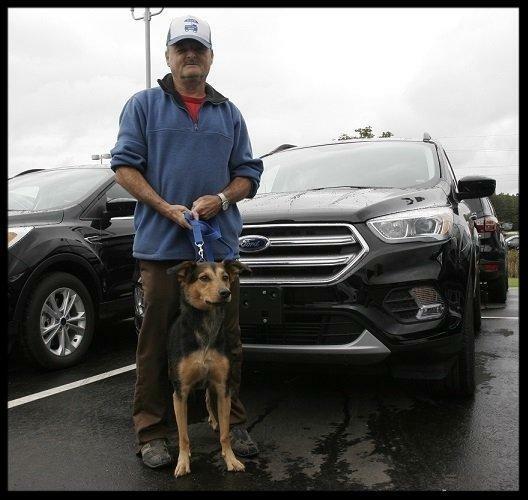 Ken Cox was in looking at a new F-150 and Tally was by his side the whole time. Tally especially liked the popcorn in the showroom! 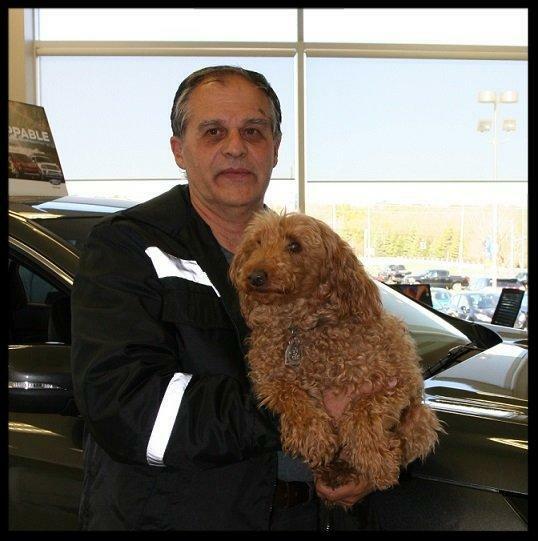 On our sale day April 14th Steve & Debbie MacKay were in for service and brought Charlie along. Charlie was the star of the show and is our first Dog of The Week.